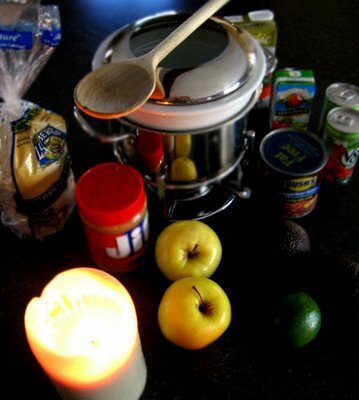 Handy: Sterno and pot, candles, rice cakes. All indications pointed to a mild winter storm with a light mix of snow and sleet. No big deal for those of us planted on the spit of land that juts its elbow into the Northeast Atlantic. Winter business as usual. The towns west of us on the mainland would be hit much harder. The prediction for the mainland? Twelve inches of the white stuff. We'd be lucky to get a dusting before it changed to rain. I hardly paid attention. The snow began on Friday, big fat flakes tossed by the wind that had scoured us for days, and soon melted into rain. I made up a fresh batch of guacamole and blogged. An hour or two into the storm I began to feel uneasy. Wind slammed the house with ratcheting vengeance. The oaks and arborvitae groaned and twisted in their vigil, keeping watch despite the cruel battering. It was snowing again - sideways this time - and suddenly the energy of the storm felt more like a hurricane than a mild nor'easter. I ran upstairs and checked the windows and skylights. All were locked. We were snug as bug. The wind roared and cracked like thunder. As I stood beneath the skylight glass watching the wet thrashing oaks I felt a quick animal chill down my spine. An inaudible scream shot through my hearing: get back to ground level- now! I ran down the steps and grabbed the kitchen flashlight. I opened the candle drawer. That's when we heard the thud. One of the oldest, tallest red oaks had split. And crashed on the roof. Onto the skylight. Animal instinct? It's alive and well. The big question at a time like this- when it's cold and dark and stormy and there's no fireplace to warm you? You start thinking, What's for dinner? Unfortunately, Dear Reader, we do not have a wood stove. Or a gas stove. Or even a grill. No power here means no heat- and no cooking (and no coffee?!). We gathered matches and candles and pulled on extra sweaters. We decided to wait it out and played a few games of Scrabble. The snow continued to fall and the house got colder. Supper hour stomachs were growling. We looked at one another, eyes big. Feeling sheepish. Do we wait or raid the pantry- will the power be on soon? The truth is- I am more than humbled to say, Darling- I was absolutely ill prepared for this event. I blame only myself. Although I keep a well stocked gluten-free pantry, it's also based on the postmodern assumption I can run out to the local store at any time (open 24/7 and habitually stocked). As early dusk turned to pitch black, it looked like dinner was going to be rice cakes and peanut butter. I rifled through the possibilities. Then I remembered our fondue pot. I located two fondue-sized containers of Sterno. I raided the pantry with new eyes. At least we could have a hot gluten-free meal - nothing fancy - kinda like camping. Feeling a little better about things, we bundled up in extra sweatshirt layers and feasted on guacamole, sipping red wine and playing Scrabble and poker by candlelight. The storm heaved on, but it was mostly wind accented with slashes of frozen rain or wet snow. Trying to find local news on our battery operated radio was fruitless; the stations were only cranking out Christmas music and 80's anthem rock. Where was Neil Finn when you needed him? When the power was still not on by 9 PM, we layered up again, opened the can of baked beans, and savored every warming spoonful. Heating the beans and two cups of hot water for green tea used up one small container of Sterno. We saved the other Sterno for the morning, just in case, thinking: COFFEE. Priorities. After a chilly and fitful night of very little sleep (courtesy of one neighbor's hammering gas-powered generator), shut-eye deprived husband ventured out into the world to track down large steaming cups of Dunkin Donuts coffee and more Sterno, but nothing was open. Power was still out. Exhausted crews were busy clearing the obstructed roads and working on electric and cable lines. Back to Plan B. Steve and I stood in our bright but cold kitchen, thankful for our one last Sterno, and simple Melitta carafe, blessing the hot magical elixer that dripped through the unbleached filter. Breakfast was coffee with cream (kept outdoors in a box to keep it chilled), rice cakes with Jif, and fruit. Power was restored by noon (we were among the luckiest, without power for only 18 hours - several thousand remained without power for additional 20 hours, and isolated pockets are still without power). The oak tree was successfully removed from the roof, thanks to our neighbors' tree-shimmying chainsaw wielding son, Joe - and his able assistants (Steve, and six-year old neighbor Thomas, among them). Thankfully, very little damage was sustained (other than a $300 tree removal fee). And our backyard fence bit the dust. But the roof was not damaged. We count ourselves among the incredibly lucky. My gluten-free lesson? Keep a lot more Sterno and canned goods in the pantry. And listen to your gut instincts. Our ancestors knew a thing a two, let me tell ya, and they've passed down this perception in our DNA. So pay attention. And what's for dinner tonight?